If your project requires heavy-duty grade saw for quick and smooth cutting of tiles, the Lackmond Beast 10-Inch could be what you are missing in your tool collection. Manufactured to hold up in the most challenging working conditions, this model is, by all means, superior and ideal for professional use. In fact, if you have some massive tiling work, this could be separating you from a perfect timely finish and a struggle to accomplish the task. The first element that will draw your attention to the Lackmond Beast is the specially designed and robust rail system that goes a long way in ensuring users achieves ultra-precise cuts. The remarkably engineered system is supported by laser guides that make finding the exact cutting line no bother. You can execute cuts at fixed intervals of 22.5⁰,45⁰, and 90⁰ as the project may require thanks to the bevel feature. The plunge cut facility will give you more flexibility to carry out other unique cuts such as V-Cap or cut-outs for wall sockets among others tricks. Despite the fact that it offers one of the largest cutting capacities, handling tiles measuring up to 24 by 24 inches, this tile saw maintains accuracy to within 1/32 inches which is no doubt outstanding. Its cutting depth reaches 3-3/8 inches when the blade gets positioned at a 90-degree angle. Installing tiles is one aspect of construction work that many people find demanding considering the keenness it takes to get the perfect fit. Most of the time even experts with years of experience under their belt see the process as a little puzzle and have to exercise a lot of caution to get the desired results. Needless to mention, tiling can’t be any simpler for newbies. However, with a befitting tile saw the process can be easy, fun, and remarkably efficient. That means a tile saw is a specially designed tool that helps those working with tiles execute different cuts precisely and quickly. When you are dealing with delicate and equally hard stone, porcelain, ceramic or granite tiles among many more, you will find these tools extremely crucial in the accomplishing various projects to expectation. At this point it worth pointing out, that tile saws are not like their metal or wood counterparts. Some models may have a degree of resemblance at face value, but the working mechanisms are not comparable. When it comes to getting the most appropriate tile saw for the job, it takes more than a random Google search and placing an order for the first model that pops up. Tile saws vary in features and components thus requires careful consideration to spot what matches your tiling needs eventually. We know the selection process can be a headache for most buyers so we came up with some factors and features you may want to look out for to lead you to the best. A product of one of the biggest power tool manufacturers, the DeWalt D24000S wet tile saw is an excellent pick if you need efficient and prompt results on matters tile cutting. As a high-end model, this is by all standards a powerful and versatile tool with excellent cutting capacity that most professionals will find up to the task. Not only it is equipped with all the advanced features associated with modern tile cutting saws, but it also designed to offer smooth operation. To begin with, this tool operates on a high torque 1.5 horsepower motor which makes it ideal for demanding projects. No tile will be too hard to crack with the kind of power this gadget puts at your disposal. 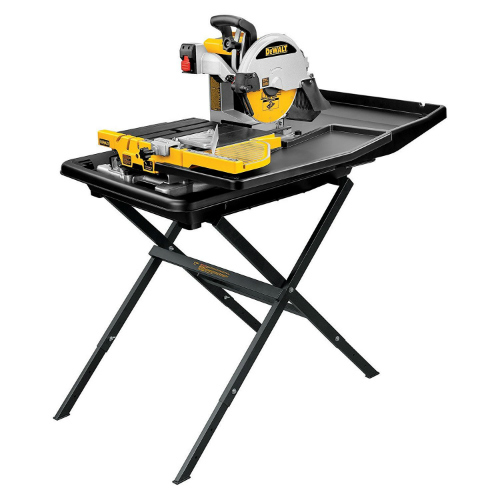 Notably, the DeWalt D24000S dwarfs other models with an integrated cantilevering rail system that offers a ripping capacity of 24 inches and a further 18-inch diagonal cutting capacity. It also has the provision for the miter feature which allows angular cuts of 22.5 and 45 degrees. The D24000S works with a steel blade measuring 10 inches in diameter and is 0.06 inches thick which make it suitable to rip through materials such as porcelain, ceramic or pavers just to mention. Furthermore, it offers a cutting depth of 3-1/8 inches which is more than what most models are designed to deliver. And in case you want to replace the blade, there is a key that comes in handy. The DeWalt D24000S has a water capacity of 5 gallons, and its dual adjustable water nozzles can be fixed on the back or sides to hold run-off water and the spray-over emanating from the blade. As a result, your working space will remain clean throughout the cutting process. Otherwise, the water holding trays and the cutting cart can quickly be taken off, cleaned and put back in position. If you do not have a reliable working surface for anchoring, you have nothing to worry about because this model comes with a sturdy stand which is very useful for those on the go because it can get folded when you dissemble the unit. Furthermore, the overall design is very condensed so moving it to wherever you want won't be troublesome. The build quality is noticeably superior. The rail system, for example, is made of stainless steel which is resistant to corrosion. It means there is a guarantee for extended of use the intensity of the project notwithstanding. If you have been thinking of getting an all-rounded tile saw that comes with all the innovative features and specifications that you can find in any tile saw, then the DeWalt D24000 is for you. A complete professional version, this model comes with all the sophistication required for to complete most tiling tasks. Therefore, if tiling is what you do for a living, you will find this an incredible game changer now that it guarantees reliable, precise results. With it, you can go ahead and accomplish your projects within record time without the slightest interruptions. The D24000 features an integrated rail system that lets the user rip tiles and execute diagonal cuts quickly and efficiently. This model also comes with an incredible edge guide allowing accurate 90⁰ cutting trajectory in addition to 22.5° and 45° miter cuts. The measurement guide makes the lining and fastening the fence in position a very seamless affair. And since top of the table is rubberized, there is no chance that a tile being worked on can ever slip away. The saw comes with ample cut depth of up to 3-1/8 inch and ripping capacity of 24 inches. Operating on a precision enhancing cantilevering cart system, you will benefit from unlimited cutting possibilities such as executing perfect cuts on V caps, ridge tiles, and the likes. Not forgetting that this gadget runs on a 1.5 HP motor that delivers just enough power needed to slice through the toughest material you may throw its way. 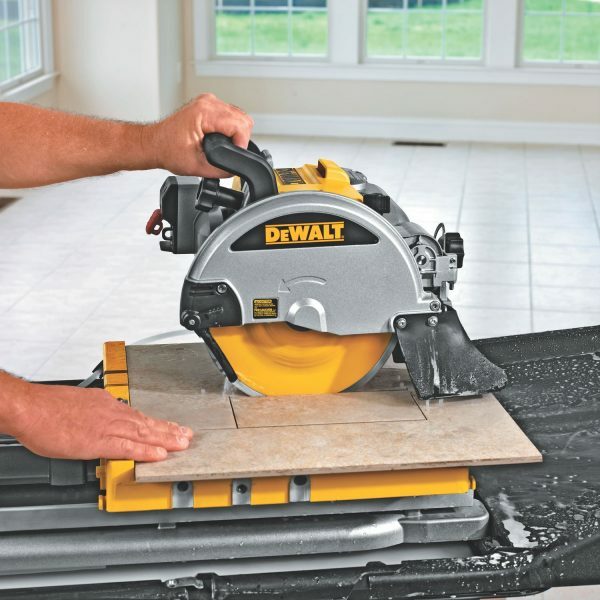 Talking of mess and splash associated with wet tile saws, Dewalt is on top of the game to ensure the users of this machine do not have to suffer such indignity as is the case other models you may have come across. Trays for water are strategically set on the rear, and the side to contain runoff water that usually escapes when the machine is under use. The dual water trays can be adjusted smoothly on a need basis to ensure maximum water placement on the blade consequently keeping it in the perfect working shape. Furthermore, the D24000 has flaps of rubber on the top part of the saw that suppresses the sprays that come out the blade. In essence, your working area will remain free from typical tile saw showers or discharged water because the dual nozzle guarantees sufficient water control. The DeWalt D24000 presents the best way to get your tiles cut accurately without breakages. Its powerful and versatile design will give you the performance of a lifetime. Although the pricing may appear out of reach for some people, you will be glad spending on this tool, especially for professional work. The 3540-02 is another top tool that any individual in the business of fixing tiles will appreciate. Coming with multiple features that would ease your work this model is built to help pierce through porcelain, ceramic, and pavers precisely and efficiently. With this, you can be sure to achieve perfect cuts simply because it comes with an integrated rail cut system that allows flawless operation. The 3540-02 features an adjustable rip fence with miter gauge that allows accurate linear and angular cuts. As you tilt the table, you will be able to execute bevel cuts ranging from 0⁰ to 45⁰. When the cutting blade gets aligned at 90°, the saw offers a 1⅜ inches of cut depth, but as the table adjusts, it will afford a cut depth of up to 1-inch at 45°. 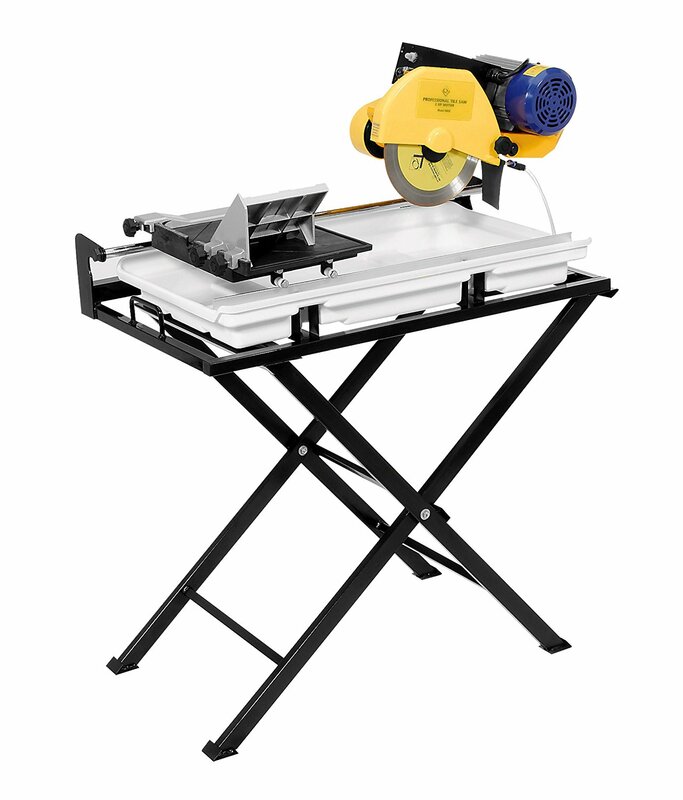 Nonetheless, this tile saw boasts of a maximum rip capacity and diagonal cut capacity of 14 inches. It is designed for use with tiles measuring 12 by 12 inches however since it's not a sliding saw, even longer tiles can still get cut on it. If you have some experience with this kind of tool, it's pretty much possible to cut any size no matter how much it overlaps. Matching to the power requirements of various tile cutting jobs, this model runs on a 4.2 horsepower motor. The motor can produce up to 3600 rotations per minute which are by far sufficient for most tasks that may call for a wet tile saw. This tile saw's blade will cut thick tiles made of ceramic with no problem considering it's a product of hardened steel. It is changeable by key hence you can quickly make replacements as the need arises. And it gets better because when you buy the 3540-02 unit, it comes with 7-inch diamond blade that adds to the cutting blade options. Ideally, the diamond blade is designed to offer users quick and smooth cuts. At 17.7 pounds and 18 x 14.5 x 7.8 inches in dimension this tile saw is considerably lightweight making it less demanding to move around. You can easily take it from one spot to another as soon as it becomes necessary. The 3540-02 features a handy cooling water reservoir that not only ensures the blade remains cool but also limit dust and debris produced during the cutting process. In fact, unlike other tile saws to wet the blade that utilizes a pump and nozzle, this uses the splash mechanism that basically has the blade passing through the water tray as it spins. That way you have optimal water spray to ensure the machine remains as efficient as possible in its execution. The reservoir can hold up to two gallons of water which is just impressive. Overall, the 3540-02 is not too complicated when it comes to learning how it works. The tricks are not overwhelming even to a novice who has never used a tool of the kind before. This tool is also quite durable so you will enjoy all the value for a long time and when anything does not seem right, you will find the warranty package a good consolation. This option is beautifully made to help you have your tiles in the perfect shape. It is an excellent option for those on a tight budget because the pricing is just pocket-friendly. The Chicago Electric is also a nice pick whether you are a seasoned tile installer or a typical handyman who loves to undertake various tasks with a quality tool. Designed to offer sufficient power, this industrial grade tile saw will afford you all the performance you have been craving for to get your tiling works finished in the most orderly fashion. 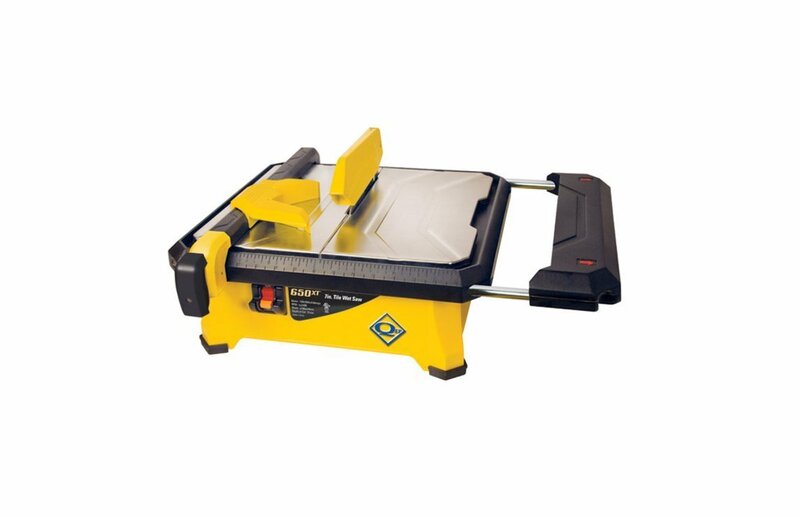 While it may not look fancy at face value, this tile saw is a popular choice for many reasons. To begin with, it features a large steel frame with precision linear bar system that serves to ensure operations remain smooth and accurate at all times. This tool boasts of a pivot head with a maximum cutting capacity of 24 inches and a diagonal cut capability of 18-inches essentially telling how serious it can perform. The cutting head is adjustable hence the blade can get tilted to slice tiles near effortlessly. The Chicago Electric utilizes a blade that measures 10 inches in diameter and is also 0.05 inches thick. The steel blade offers a cutting depth of up to 3-1/2 inches and is removable by key just in case you have to make a change. It is also appreciable that this tile saw runs on a 15Amp, 2.5 horsepower motor. The high-quality dual capacity motor with sealed bearings ensures you get results to professional standards. It can produce a maximum of 3800 rpm which in reality is good enough for quick cutting. And when the heat becomes too much to bear when the job gets tough, you will appreciate that the Chicago Electric comes with a thermal overload protection facility for enhanced durability. The Chicago Electric has a water pan manufactured of ABS plastic alongside a 3-gallon-per-minute water pump. These facilitate the cooling of the blade while also limiting the mess from resulting debris and dust. The water receptacle can be ejected and returned hence making the cleaning process pretty seamless. To give you adequate support the tool comes with a steel frame that makes sure the saw is always stable. The oversized frame coupled with table dimensions of 17 by 19-¾ inches will allow you to enjoy great precision by keeping whatever you are working on in the desired position. The Chicago Electric tile saw comes with balanced features you need to make your tile cutting experience desirable every day. The price is rational enough and taking into consideration the rugged body you may never have to buy another model anytime soon. The MK-370EXP combines all the features of a high-end tool in a single unit. Among professional grade machines in the market, this is as one of the most affordable options however that does not mean it will compromise on performance. Although it is a smaller version of typical 7-inch models, this tool will not disappoint when exposed to demanding projects. It features a sliding Aluminum die-cast cutting table that can rip tiles with a length of up to 18 inches and 13 inches for the diagonal. The cut depth, on the other hand, equals 2 inches and is sufficient for expected material thickness. In addition to the 7-inch long, 0.05-inch thick blade, you have another diamond blade included in the package. In case you have to make changes, the process is simple because there is a key that does it, and the hinge blade guard makes your work lighter. The cutting head of this saw can be inclined for 45° bevel cuts. Coupled with the integrated rail system, users are guaranteed quality cuts throughout. Besides, the manufacturer takes extra steps to enable you to achieve greater precision by including a linear bearing and chrome plated guide bar. The feature serves to give you quick reference during assembly such that the cutting trajectory will always be accurate. When it comes to power, you cannot dismiss this model based on its size. The 370-EXP is dutifully endowed considering it runs on a 1.25 horsepower, 7.4A electric motor that can generate a maximum of 6000 rotations per minute. The high torque motor reveals that it is the little powerhouse that will not be threatened by robust materials. For safety considerations, this tile saw comes equipped with a lock key which stops operation when taken off. The MK-safe switch is quite useful in the sense that once disengaged you never have to worry about accidental start-ups. 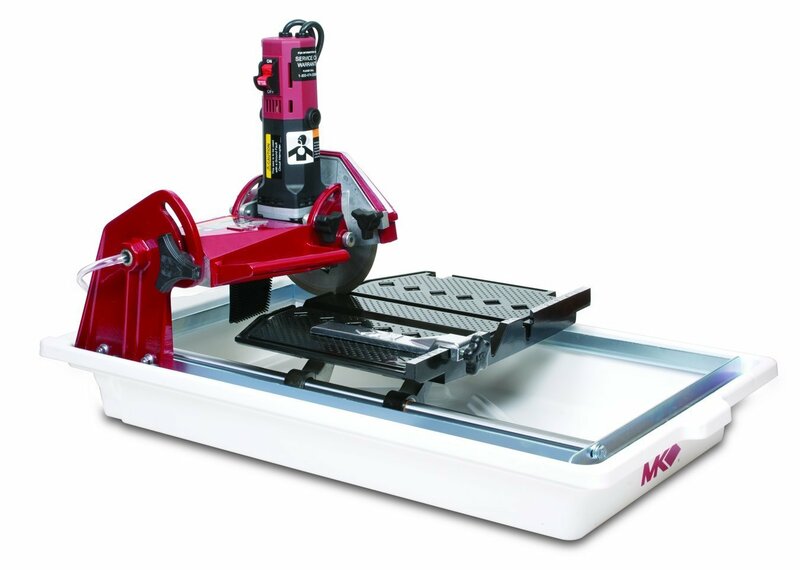 As a wet tile saw, the MK-370EXP features an integral two-gallon capacity water receptacle that facilitates efficient operation. It helps keep your working surface free from the mess from the dust and debris produced. You will enjoy assembling, using, and maintaining this tool for many reasons. For example, setting up this model is straightforward and easy to grasp. It also features a maintenance-free, self-lubricating pinion and gearbox which by design will demand minimal intervention to remain in good working condition. When it comes to cleaning, the carting cut and the water tray are detachable, so you will have no problem getting rid of accumulated dirt. At 33 pounds, the weight of this tile saw is manageable if you want to move it from one spot to another. As such, whether you are working at home or elsewhere for large-scale contractual projects you can conveniently have it within quick reach. Besides you have a rigid single piece zinc-plated steel frame that offers support. The overall construction is highly durable hence will provide timeless service. Regardless of the scale of a project, when it comes to tiling precision and accuracy are vital considerations if you have to achieve the intended outcome. Thanks to recent improvements on tile saws, you no longer have to tolerate inefficient tile cutting machines at the job site. The SKIL 3550-02 7-inch wet tile saw in this light provides value whether you are renovating or handling new tile fixing projects. A slight upgrade from the 3450-02 model, this version has been manufactured to afford tile workers the edge they need to get to work without second thoughts. The SKIL 3550-02 is inherently different from many models you may have come across or eventually will. And here is why. It comes with an innovative hydro-lock system that helps keep the blade watered during operation. The system's upper and lower guards hold water near the blade thereby cooling it and enabling greater accuracy during the cutting process. It also ensures that minimal cleaning is necessary after use. 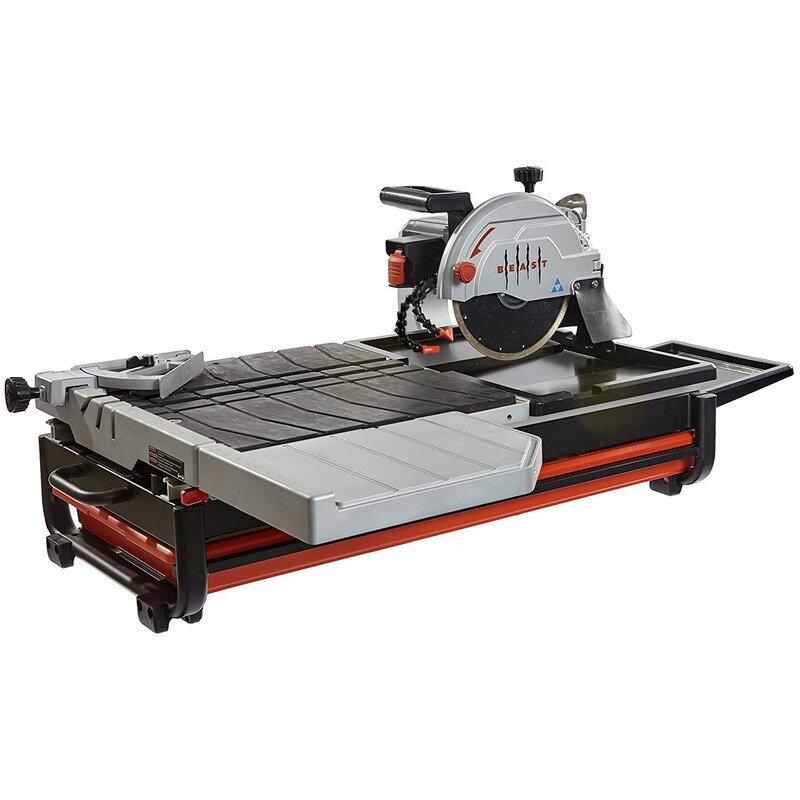 Again, it boasts of an integrated rail cart working mechanism and miter gauge feature for 45 and 22.5 perfect degree cuts. The SKIL 3550-02 has a rip capacity of18 inches and a diagonal cut capacity of 12 inches. The flexibility of the rip fence allows both straight and mitered cuts, meaning you have no hindrance if you want to achieve a variety of cuts. Talking about versatility, the tool's sliding side extension can be utilized on either side of the table and is designed to supports tiles measuring to the limit of 18 inches. The table surface, on the other hand, is made of Aluminium to ensure longevity because there is no chance that it could suffer from corrosion even though it is always in contact with water. 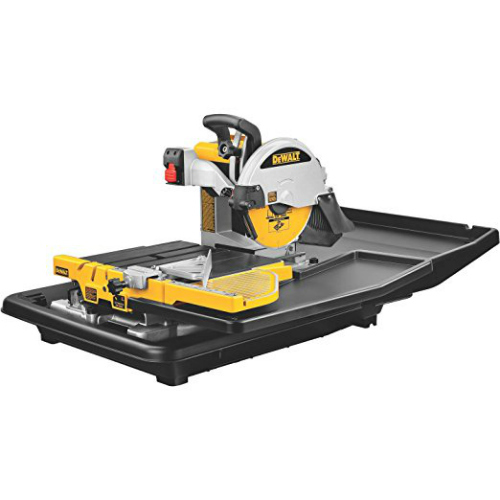 This tile saw guarantees outstanding possibilities with 7 Amp motor and a 7-inch diameter 0.05-inch thick blade. With it, you can cut materials such as stone, ceramic, porcelain, and pavers without much ado. As if that is not enough, this tile saw also uses a continuous rim diamond blade which is preferable if you want to realize hassle-free even cutting. Any user will be glad to have a tile saw that is not sophisticated when it comes to set up and use. The SKIL 3550-02 in this aspect ticks the boxes. For instance, when it gets to maintenance the cutting cart and water holding trays can be ejected efficiently and returned to the place after cleaning. Moreover, it weighs only 24 pounds which is not much compared to most high-end models. The comparatively lightweight nature makes it portable, a real plus for those who intend to change its location regularly. The SKIL 3550-02 is a superb mid-range model that you will find worth your money because it is bound to deliver nothing short of top-notch results. While it may not be the super top tile saw on the market today, it still has a lot to offer if you need to get your tiles in order, not once but probably for years. As the name puts it, the tile saw is a real beast with regards to power. Running on a 15 Amp motor, it can cut the hardest tiles you are about to use resulting in the required shapes and sizes without the slightest hesitation. Besides, it boasts of a leading industrial design that is literally telling of its suitability to handle strenuous and substantial work. The components of the Lackmond Beast are unyielding and will furnish you with all the strength you need to finish the job. And for absolute water flow regulation, the manufacturer included a double snake pipe system. Consequently, the quantity of water reaching the blade at any point in time during the cutting process is controlled and consistent. The water system is attached externally making it reachable for quick draining and replacement. Notably, the water pan has a divider that sifts and prevents slurry from invading the pump thereby stretching the pump's lifespan. The pump, in this case, can be placed in the water tray or side bucket. If you think the resulting splash will soil your working surface, you are wrong because this model is equipped with a strategic blade splash guard and splash tray that will trap all escaping droplets. As a versatile tool, you do not need a worktable for set up. It comes complete with a gravity stand to keep it steady and ready for use. And when you have larger tiles to work on, you will appreciate the detachable extension table that adds the working space. The manufacturer also includes a Lackmond 10-inch diamond cutting blade to grant you an additional cutting option. The QEP 60020SQ tile saw is another fancy model that any handyman would find helpful in the quest to complete tile installation works. This tool is designed to drown users in a pool of enthusiasm through its superb features and components. Without a doubt, it will make your tiling experience fun and hassle-free. Being a corded version, it is powered by electricity and runs on a reliable 2-horsepower motor. The inherently high torque motor enhances this machines ability to slice through the hardest porcelain, marble, tiles, and the likes. To allow optimal functionality, you do not need adapters or converters to have it operating. Just like in most models, this tool's cutting table employs a slide-tube mounting system for smooth and precise cutting. The QEP 60020SQ wet tile saw makes good use of 10-inch diameter, 3-1/4 depth cutting wheel to rip through the various materials. Ideally, it can cut tiles with dimensions of up to 24 by 24 inches with further capability of diagonal cuts to the maximum of 14 by 14 inches. And it has the miter feature and 45 to 90-degree rip guide features that allow angular cutting. The model comes with a high pump volume and dual water spray system that regulates and balances water distribution. By supplying water evenly around the blade, the system plays a crucial role in ensuring flawless performance of the tool. It takes care of the safety of the blade by cooling and cleaning it during the cutting process, and as a result, you will benefit from extended lifetime while in use. It also employs an automated thermal overload feature that deters it from overheating and damaging the working mechanisms. One feature that makes this tile saw from QEP stand out from many other alternatives is the variable speed setting. The 60020SQ gives users the freedom to play around with two-speed settings depending on what it takes to cut different materials. Likewise, you can also alter the saw's RPM to allow usage of different blades. As such, you can always coordinate the ability of different blades usable by this model and the nature of the materials you need to cut. This tile saw measures 40 by 24 by 20 inches and weighs 60 pounds and can be a big deal to handle minus a stand. The manufacturer had this in mind, so a robust stand is included to enhance ease of use. The base is foldable for more convenience and besides anchoring the unit; it also provides support for the tiles getting cut. If you are concerned about safety, this model has a child-proof lock on/off switch that prevents any accidental or unintended startup. The QEP 60020QS tile saw may not be the ultimate high-end model, but still, it cannot be overlooked because it built for the job. While this is recommended for professionals, the reasonable pricing might just push anyone into acquiring it for whatever project they have in the pipeline. For many professionals familiar with top-rated power tool producers, the Bosch label needs no introduction when it comes to quality products. The brand has established itself in the hearts of many handymen who find reliable working partners in their robust, versatile, and user-friendly tools. When it gets to tile saws, in particular, the narrative is not any different. The Bosch TC10 10-Inch comes with an artistic design and cutting-edge traits meant to maximize timeless user experience. Cutting tiles with this tool is swift and effortless. As a heavy-duty version, it operates on a 1.5 horsepower motor that can produce 4200 rotations per minute which is pretty sufficient for a wide array of tiling projects. Similarly, the TC10 offers 24 inches rip capacity and 18 inches cut capability for the diagonal. It can slice through materials with a depth of up to 3-3/4 inches. You also love the bevel feature that allows tilting of the cutting head for precise execution of 45⁰ and 22.5⁰ cuts. The BoschTC10 uses a 0.06 inches thick blade measuring 10-inches in diameter. The blade is a product of high-quality steel and is changeable by a key. If you have utilized any tile saw before, you definitely understand the possibilities you can achieve with this type and size of the blade. As it is with other top-rated wet tile saws, this model comes equipped with expanded rear and extensions on the side which functions to counter water over-splash and consequently minimize chances of water spilling all over the working surface. This is crucial in that it guarantees comfort during operation because no one wants to end up having water, dust, and debris messing up the working surface. Its water pan can hold a maximum of two gallons hence the machine has a constant and sufficient supply of water to keep the blade cooled and cleaned for an interruption-free application. Also worth mentioning is that the water tray features a plug and designated pump retainer which comes in handy when it is time to drain and tidy up the container. This model is therefore easy to use and maintain. When it comes to durability, the Bosch TC10 leads the way with sturdy build comprising of Aluminium cast base and frame. That is to say; it will remain steadfast providing fast and accurate cuts for years without needing regular part replacement. 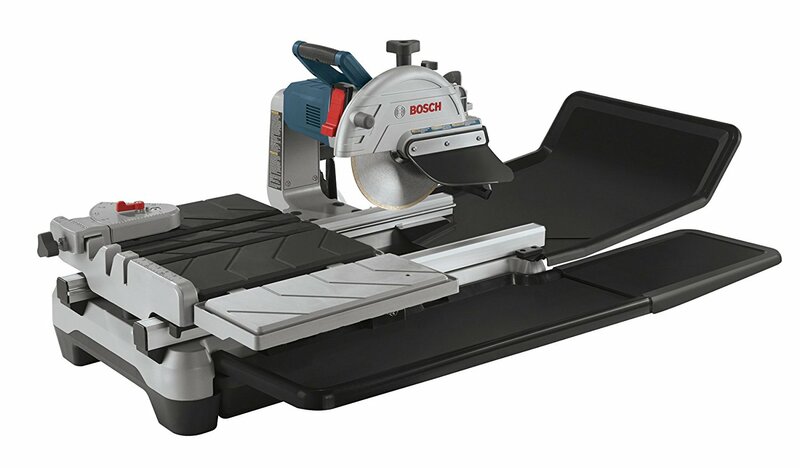 Although the Bosch TC10 tile and stone saw is pricey, that is accounted for by the valuable results you are bound to achieve in using it. You will be pleased with how simple it is to complete cuts and get the outcomes. All in all, this is a fantastic option for professionals whose daily work routine revolves around tiling projects. When you need an excellent cutting machine that balances features and price, the QEP 22650Q could be one of the best bets to accomplish the mission. Coming with a result-oriented design, this tool is endowed with most if not all the useful features you can imagine of a tile saw. It's efficiency when it comes to ripping porcelain, stone or ceramic tiles stems from first and foremost, the ¾ HP 120 volt motor that can generate up to 3600 rotations per minute. The all-powerful motor aligns it to the realities of the most challenging tile cutting endeavors making it a sure winner should you throw some of the hardest materials mentioned above its way. Likewise, it relies on a reliable integrated rail cart system that anchors the blade in position to give the required cuts. Furthermore, the 22650Q model rides on miter gauge for cuts at 22.5⁰ and 45⁰ cuts. The features combine well to make the tool a cutting genius because it can execute great linear and angular cuts as different jobs may demand from time to time. 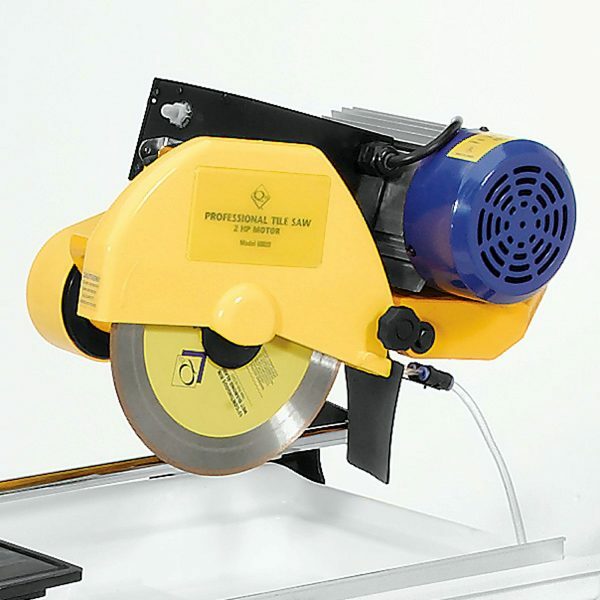 This tile saw uses a steel blade with a 7-inch diameter and is 0.06 inches thick. The blade can be replaced, and there is a key to that effect that facilitates quick and flawless changes. In addition to that, it has rip capacity of up to 30 inches and a complimentary 30-inch diagonal cut capacity. And with 1-1/4 inches of cut depth, the ability of this tile saw to deliver result is undoubtable. As is expected of a wet tile saw, the QEP 22650Q has a 2-gallon capacity ABC plastic made water reservoir. The water reservoir is not permanently fixed to allow seamless removal for draining and cleaning. Moreover, it is fitted with a water fender in the interior to limit water splashing out. In essence, the water pan and supply system functions to ensure the working surface remains dry and the user remains comfortable when working with the machine. The construction of the QEP 22650Q tells of a machine that would serve for extended periods. Taking into consideration the durable frame and table both equipped with rubber footpads, you will enjoy high-level stability at all times of operation. Not to mention that there is the provision of 8-inch table extension which will help you make adjustments to accommodate larger tiles. And since the whole unit weighs a mere 15.7 pounds, setting up, dissembling, and moving this tile saw from one point to another will not be any problem. The one reason why people require tools to carry out tasks is that they want to use as less effort as possible. It’s needless to say that the motor provides the alternative energy and keeps the tool running to get the job done. The amount of power a machine can produce is determined by the horsepower rating where the larger the number, the more torque a tile saw is bound to deliver. Usually, the power of a particular model reflects the speed with which you can execute cuts. With this in mind, when making your choice, consider comparing the intensity of the task you will be working on and the level of power that makes the perfect match. Going for a higher HP could be overkill if you have light tiling jobs the same way a lower HP tile saw may not meet the demands of heavy-duty projects. Having a proper, versatile blade should always be a key consideration while shopping for a tile saw. 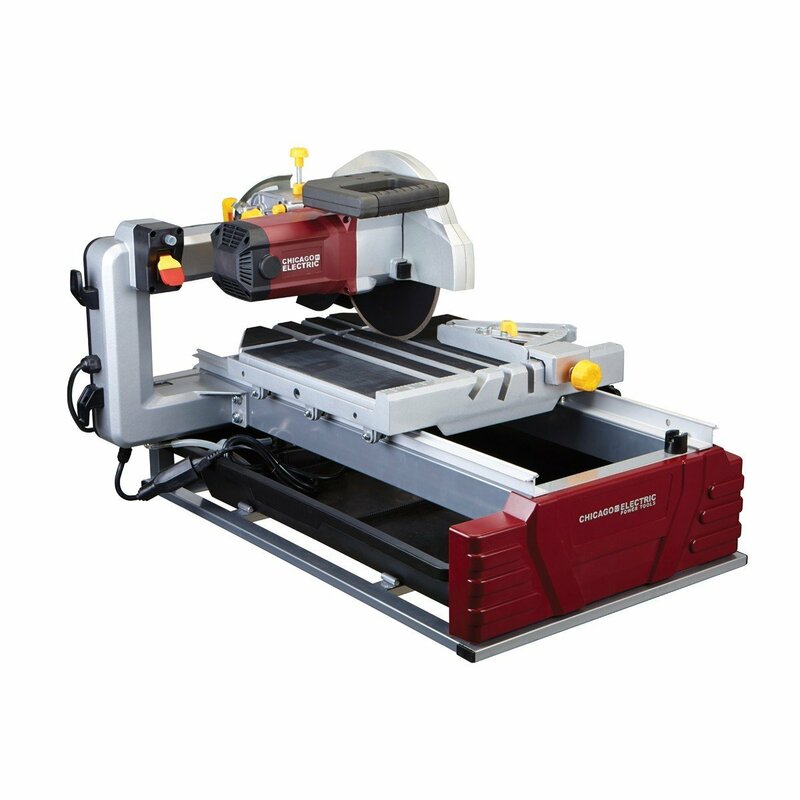 As a matter of priority, your choice for the best tile saw should be guided by the cutting capacity needs. To this end, you should pay attention to the size and cut depth abilities of the model you pick. Ordinarily, most options you will come across have blades with varying diameters and thickness, so the cut and rip capacities are equally different. The variance of dimensions notwithstanding, you should always endeavour to find the right blade that is suited to handle the size of tiles your working with. Again, look out for models that have an integrated rail/cart system that holds the blade in position for better accuracy. You should also consider other adaptability features such as the ability to use blades of different dimensions, ease of replacement, and the inclusion of an extra blade in the package. Tiling is not a one minute job; it can be draining if the tool at your disposal does not have the traits to make the process quite smooth. So besides the power, a tile saw can produce, consider how easy it is to set up, use, maintain, and disassemble the machine. Also, it is reasonable to check out for features such as a rubberized table top, adequate working surface or table extension abilities. It is helpful when it comes to working on tiles of different dimensions without risk of any piece slipping away. If you are not going to work at a fixed point, consider going for a lightweight model whose weight is manageable should you need to switch location. The water supply, regulation, and containment features play a significant role in the whole game of ensuring the cuts achieved are as accurate as possible. Tile saws rely on water for blade cooling and lubrication as well as to curtail dust and debris during operation. Therefore, you should look out for a model with sufficient water capacity and should also be reliable when it comes to controlling and supplying consistent volumes of water on the blade during the cutting process. Furthermore, the water holding trays should be easily removable for quick draining and clearing of slurry that will accumulate over time. 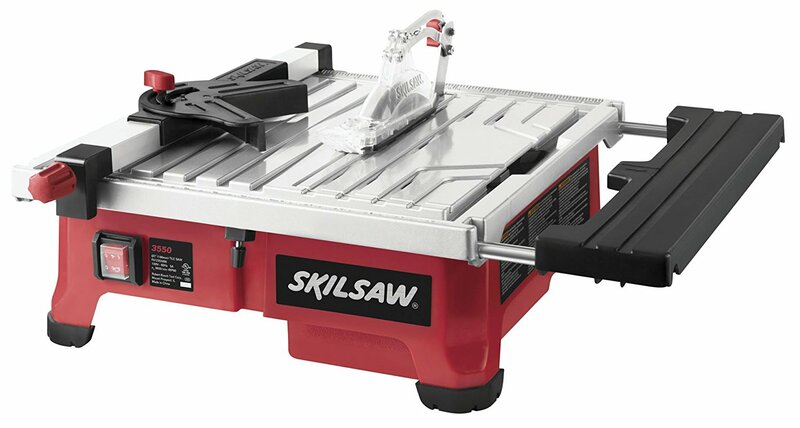 Q: What is the best tile saw brand to buy? A: Well, in your search for the best, it worth noting that no brand or even model is unconditionally faultless. In most cases, you will find that each version is designed to suit specific demands. For example, some are manufactured for light and occasional jobs while others are better suited to take on the toughest works on daily basis. So the requirements of the tiling project literally determine the best. 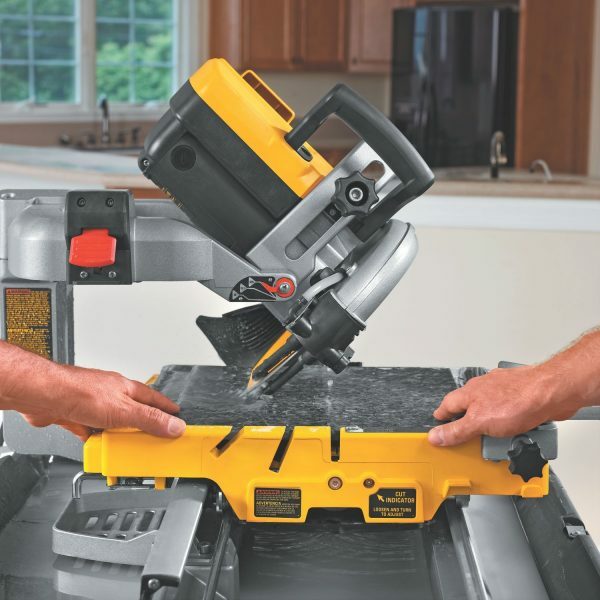 Q: How can I get the best tile saw for the budget? 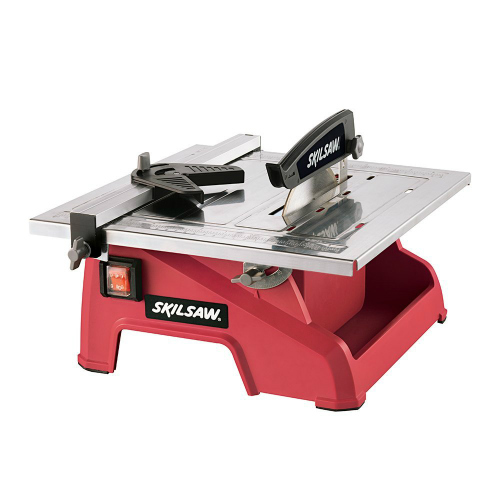 A: Typically, the pricing shows the capacity, features and built quality of the specific tile saw. While it is common to find that the most expensive versions come with multiple high-end features that guarantee better results, you will also find affordable alternatives with standard traits and components. Therefore, you can always find one that fits a tight budget without compromising on performance. With so many brands producing countless tile saw models, the only way to arrive at the best is to consider the nature and intensity of the tiling projects you intend to perform. Usually, no particular version or brand can be absolutely all-rounded. In other words, you will be better off with what you can afford so long as it can get you satisfactory results. Otherwise, by considering factors and features such as power, blade and cutting capacity, durability, water system, and convenience, you will end up with something optimized for your needs.